The primary etiology of vesicovaginal fistula in developed countries is surgical trauma associated with gynecologic procedures. Abdominal hysterectomy has been shown to be the most common cause, with vesicovaginal fistula occurring in approximately one of every 1800 hysterectomies (7). Secondary causes include complications of obstructed labor, and radiation therapy of urogynecologic cancers. The primary etiology of vesicovaginal fistula in developed countries is surgical trauma associated with gynecologic procedures. Abdominal hysterectomy has been shown to be the most common cause, with vesicovaginal fistula occurring in approximately one of every 1800 hysterectomies. 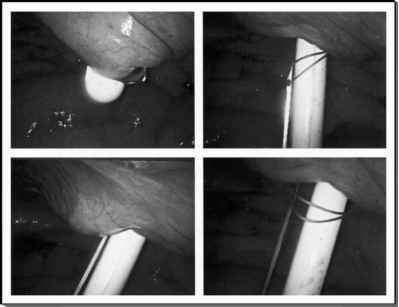 bladder injuries (bipolar injury without perforation vs. 2-0 polyglactin suture through the bladder wall vs. bladder laceration with monopolar cautery that was repaired with 2-0 polyglactin suture) and vesicovaginal fistula formation in an animal model. Vesicovaginal fistulas were detected only in the groups with monopolar cautery bladder injuries. It was concluded that an electrosurgically induced cystotomy and repair of the bladder during the performance of a laparoscopic hysterectomy was associated with the formation of postoperative vesicovaginal fistulas. Flynn and Amundsen (10) noted multiple cavities in the vaginal epithelium and pathologic evidence of chronic inflammation in an acute setting in a patient with recurrent vesicovaginal fistula. They suggest that vesicovaginal fistula formation is multifactorial and that additional factors besides bladder injury such as chronic infection and formation of small abscesses may also play a role in the formation of postoperative fistula. In addition abscess rupture may be a mechanism for fistula tract formation.